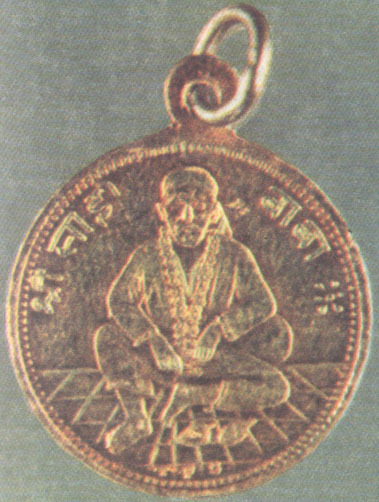 The medallion created by Baba, showing Shri Shirdi Sai Baba's picture on one side, with the letters TPS underneath it (Magnified x 3.5). 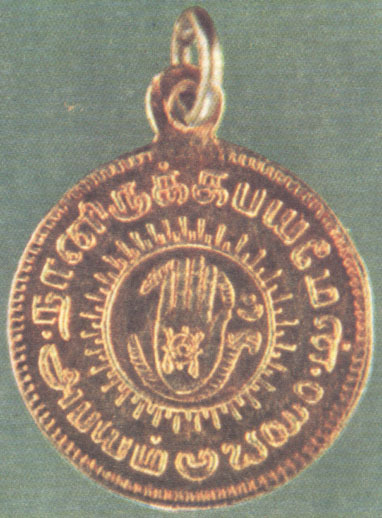 The other side shows the right palm, indicating Abhayahasta. The sign of the conch in the centre of the palm signifies sound or movement of Creation. In the Avesta, the timeless, formless and motionless state of God is called Zravane-Akarena, before creation took place. Sound came forth from the placid ocean of Eternity and it was known as Zravan-e-darego-khadata. The symbol AUM is interwoven with the palm and it signifies the Word of Creation. The Vedas state, "In the beginning was Prajapati, the Brahman; With whom was the Word; And the Word was verily the Supreme Brahman." In the gospel of St. John I:I, it is stated, "In the beginning was the Word, and the Word was with God, and the Word was God." Baba says, ''To hear that sound one has to approach as near as possible, the core of one's being. That is why the Upanishads are so named; Upa means near and Nishad means sit. Go and sit near, so that you can hear the whisper of the Super-Soul to the Soul. 'AUM TAT SAT' says the Gita. It means That which is Truth is AUM." A soft continuous chanting of this Word produces a unique energising effect on the body and the mind.